Low-sugar jams and jellies can be a tasty topping for the multigrain Thomas’s English muffins I’ve been enjoying lately. But I’m finding the world of jelly and jam can be a sugar mindfield. There’s regular jams and jellies, which have sugar added. Then there are no-sugar-added varieties and low-sugar varieties, meaning, as always, read the labels if you have concerns about eating sugar. Smuckers new fruit and honey spread. Nutrition information shows 8 grams of sugar per tablespoon. 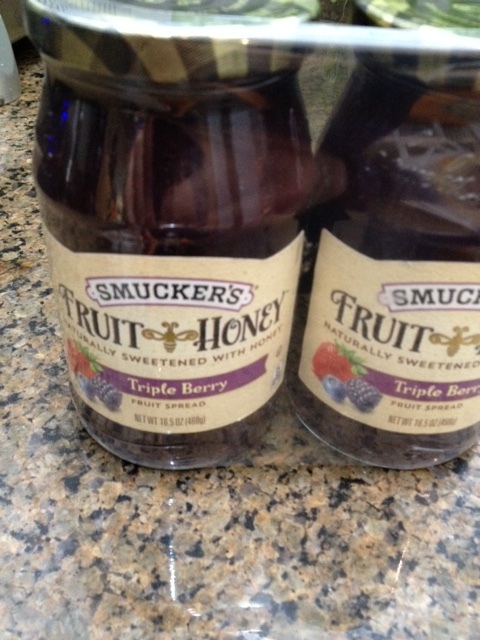 Smuckers has a new variety out that further muddies the waters by using honey as a sweetener instead of sugar. Honey is in vogue these days but the reality is it’s all sugar to your body, nutritionists have told me. 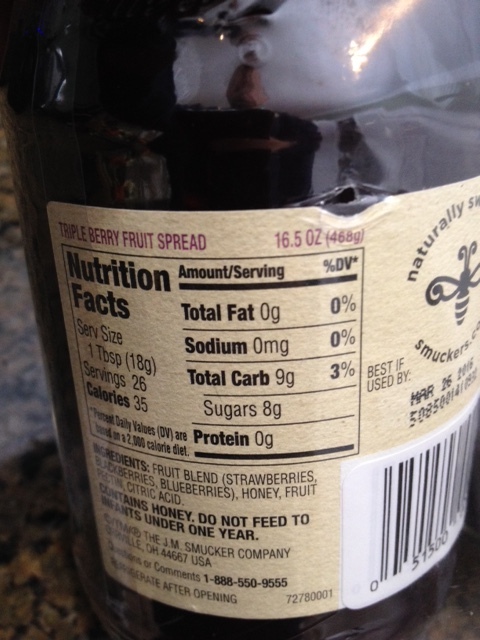 So even with Smuckers new Fruit and Honey spread, look at the nutrition label. The news there isn’t half bad. Each tablespoon of this spread has 8 grams of sugar. That’s less than regular spreads, more than some of the other varieties I’ve mentioned. I tried this during a taste test at Costco and enjoyed the taste. It doesn’t have the overwhelming sweetness of sugar, so the fruit taste comes through. I’d buy it again, although even the Costco price, which worked out to about $4 a jar, seemed high to me. It must be a new product debuting at Costco, I can’t find mention of it on Smuckers’ website. Let me know if you find it in a store near you. Panera dropping ingredients; how about cutting the salt?